In Bollywood, nobody is in a mood to accept their relationships. Bipasha Basu and Karan Singh Grover kept on denying their relationship till the very end. It is kind of a Bollywood tradition to refer to a boyfriend or girlfriend as your best friend. Here are some couples that we wish came out in the open to admit that they are in a relationship with their partners. Sushmita Sen and Ritwik Bhasin : The diva never talks about her relationship even though Ritwik is known to be her tenth boyfriend. The difference is: the relationship with Ritwik seems to be stable as they have been together for about two years now. Thats a long time considering Sushmita’s earlier record. 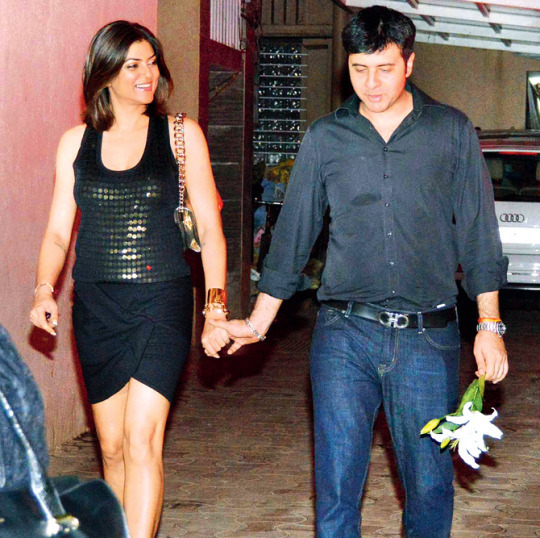 Don’t you think it is time that Sushmita introduces her boyfriend to all of us formally? Siddharth Malhotra and Alia Bhatt : The press has been going gaga over their friendship for about one and half years now but that doesn’t seen to cut ice with the couple. Both Sidharth and Alia smile at the camera the moment a question is asked about their current relationship status. If one year is not enough enough time to make up your mind, then it will never be. It’s time Alia, let’s hear it. Shraddha Kapoor and Siddharth Roy Kapoor : They were hooked to each other ever since they started shooting for Aashiqui 2 that made the box office go in a tizzy with their amazing chemistry. They drifted apart for a while but now we hear that they are back with each other. We think it is a better way to announce their reconciliation with a lovey-dovey interview professing their love for each other. Nargis Fakhri and Uday Chopra : They tweet lovey dovey messages to each other and were even spotted holidaying with each other. However when it comes to professing their love for each other, the two have hopelessly remained silent. Esha Gupta and her mystery fiance : Esha Gupta showed off a solitaire on her ring finger and captioned it as, “he asked and I said yes”. It was a huge engagement ring that she was sporting. It was also clarified that it was not a publicity stunt. Even before her fans could rejoice about her engagement, Esha clarified on Twitter that she is not engaged but the “size of the rock is acceptable”. Though we don’t know what is going on in her life, we just hope that she comes out in the open about it.